Alias/Nickname: Erm...Punchline is all I got. Appearance: Punchline is small for his gender, being only a wee bit bigger than the average mare. His flowy golden mane reflects his golden tongue, and his short tail emphasizes his quirkiness. He has brown fur, and freckles dot his body. 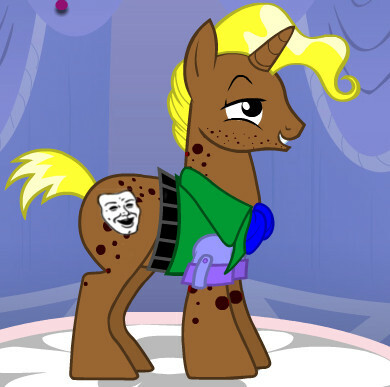 A smile always graces his face, as he always wants everypony to laugh, and be merry. Personality: Cracking a joke, belting out a pun or making a witty comment has Punchline written all over it. His easy way of making friends and talent for cheering people up has made him a well-known stallion in Manehattan. Golden hair, golden tongue, he always says. He is never without a kind word to say, though, helping old and young alike with his talent of comedy. Sample Post: Strolling through the crowded streets of Manehattan had always made Punchline smile, even though he got odd looks from downtrodden passerby. Life is a big joke, you know? And you just have to know how to tell it right. Ponies bumped into him from everywhere, muttered 'scuses me and pardons-moi. He tossed his golden mane and kept trotting along. He had to get back to the club. It was amateur's night. It was the most exciting day of the week to him. He eyed a lonely mare standing by herself and came up to her. "Hey, lady, you ever hear of the pony whose whole left side was missing?" He got a blank stare in return. Oh, this was the best part. "You haven't? Well, he's all right now." Ba-dum ksssh! The stranger looked at him confusedly for a couple seconds and then giggled. "That was an awful joke, mister." Punchline broke into a big grin, "That's the best part!"